A fox squirrel’s bushy tail flicked, then vanished. A black oak’s welted bark pressed hard against the hunting shirt’s linen shoulder. 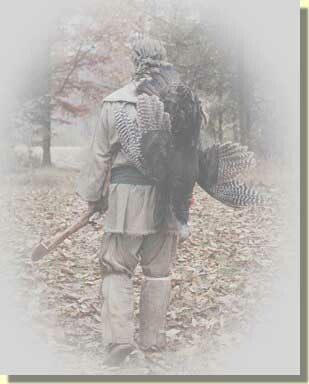 The tail reappeared, head-high, on the backside of an arching red oak, then disappeared. A slight breeze rustled what few leaves remained overhead. A brown leaf dislodged and spiraled earthward, drifting northeast. I waited. “Kee-yonk, yonk, yonk…” Over the rise, through the maple bottoms, east of the lily-pad flats on the River Raisin, a Canada goose hollered. Another honked, louder and more boisterous. There may have been others, but it sounded like two engaged in a vicious shouting match over some territorial transgression. The ruckus echoed up and down the river bottom, then died. “Jay! Jay! Jay! Jay!” A blue jay screamed from a dead spire in the midst of the huckleberry swamp. I saw it fly away out of the corner of my eye. The fox squirrel’s tail flicked again, in the same spot, on the red oak, forty or so paces down the trail. A few minutes passed. The squirrel scrambled into sight, hung upside down, then with one long, mighty leap jumped to the ground. Leaves exploded. Two big bounds and a dainty hop later the critter sat on a limbless trunk that lay on the forest floor. It wasted little time running the length of the rotting log and through the leaves to the top of the rise. I realized I had lost track of time. My shoulder ached from leaning, and my back muscles throbbed. I charted a tree-to-tree course that swung a bit east, then circled back to the white oak where I last glimpsed the fox squirrel. With the afternoon waning, the still-hunt progressed as more of a casual walk than the usual two steps and pause. 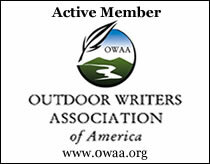 Once on the top of the knoll, I leaned against a stout red oak that stood two trees distant from the white oak. Throughout the approach, my eyes scanned the treetops, but I never saw the fox squirrel. My right moccasin scuffed away the duff at the tree’s base. Fall’s aroma filled the air. I dropped my bedroll, adjusted it with my foot and sat. It was the last week of October, in the Year of our Lord, 1795. The yellowing sun dropped below the western clouds and flirted with the tree line. The breeze died down and the air chilled. With the day spent, I eased back against the oak and gazed out upon the River Raisin. Geese floated here and there, and I supposed they were the ones I heard earlier. A wood duck whistled; somewhere over in the hidden bay, a mallard squawked. An inner calm washed over my being. I closed my eyes, but only for a few moments. Despite the relative peace that followed Fallen Timbers, it was not safe to doze in the woods. The sun grew orange; the undersides of the clouds turned yellow, then orange, then pink. I wondered if a canoe or bateau might pass with travelers bent on making the portage to the Grand River before dark. We drove in silence for a few miles. I can only imagine what she was thinking; as for me, that late October squirrel hunt came to mind. I remembered leaning back against the oak, closing my eyes, and when I opened my eyes, I fully expected to see a trader’s bateau or a Potawatomi canoe on the river. I sat until dark waiting for an 18th-century traveler to pass by, and I was truly disappointed when I walked back to the brush lean-to, packed up and headed home. I had similar feelings on my first muzzleloading deer hunt, back in the late 1970s. I missed an unsuspecting six-point buck, but the aftermath of that errant musket ball was the real prize that Sunday. After confirming my error and the clean miss, I returned to my seat on the west bank of the big swamp. My imagination ran wild, then settled down to wondering about the hunters, the traders and/or the Native peoples whose moccasins stepped on the ground where I sat, who might have shot at a deer or elk at the spring, centuries before. The common thread that connects us all, moderns and ancients, is the land. Historical plaques and re-constructed buildings contribute to the texture of the overall living history experience at places like the River Raisin National Battlefield Park or at Fort Michilimackinac, but the land that our moccasins tread upon is the glue that binds our lives with the peoples of long ago. Our hunter heroes passed through this life, so must we and so will our grandchildren’s grandchildren. Like those who came before, we are but temporary caretakers for those who will come after. As a living historian, as a traditional woodsman, my interest lies with those individuals who lived, hunted and survived not only on the family farm, but also in the Lower Great Lakes region of the Old Northwest Territory. The bonds that my historical simulations form with these people, not just from reading their words, but through experiencing what they experienced, in some small measure, is one of the greatest gifts traditional black powder hunting affords. We are visitors to the past, time travelers who share the same ground, separated by centuries. As a traditional hunter, I speak so often of my addiction to pristine moments, those fleeting points in time when my life parallels that of one of my many hunter heroes. Such happenings tick away in seconds, but the profound sense of participating in a bygone era remains. Attempting to explain a pristine moment to someone who has never experienced this phenomenon is difficult and often draws funny looks or blank stares. Yet, within each pristine moment resides an opportunity to feel a true kinship with the people of yesteryear, a chance to share their hardships and their joys, their triumphs and disasters, their successes and failures firsthand. And the common thread in all of these historical simulations is the land. 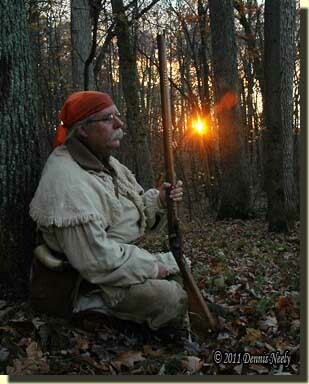 This entry was posted in Living History, Squirrel Hunts, Worth thinking about... and tagged Dennis Neely, historical trekking, North West trade gun, Northwest trade gun, traditional black powder, traditional black powder hunting, traditional blackpowder, traditional blackpowder hunting. Bookmark the permalink.